February 28, 2019: Representatives from the American Samoa, Commonwealth of the Northern Mariana Islands, Republic of the Marshall Islands, and Guam met to discuss common issues relating to disabilities on our islands and the potential on re-establishing the Pacific Basin Interagency Leadership Consortium to work collaboratively in addressing common concerns. 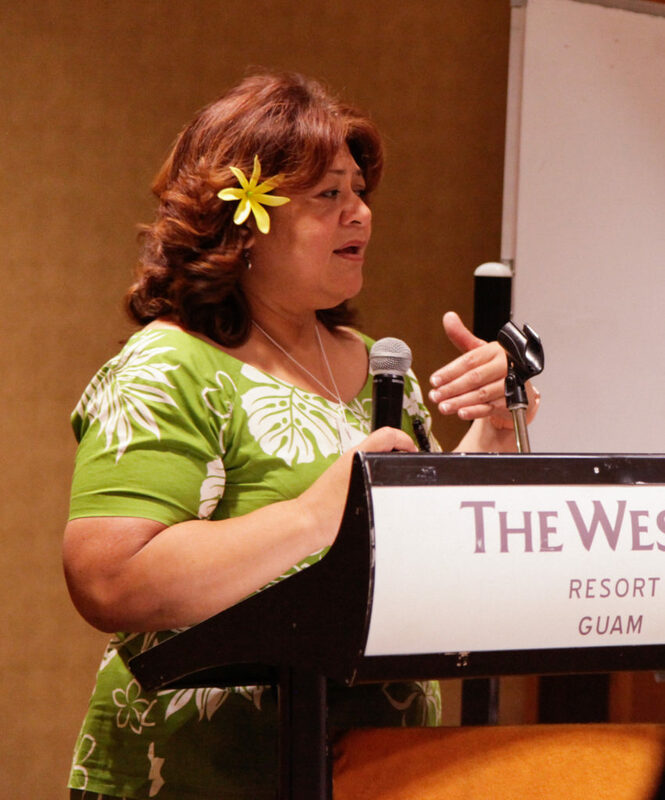 Tafaimamao Tua-Tupuola, Director of the American Samoa University Center on Developmental Disabilities (ASUCEDD) spearheaded regrouping efforts and facilitated the meeting with support from Guam CEDDERS. 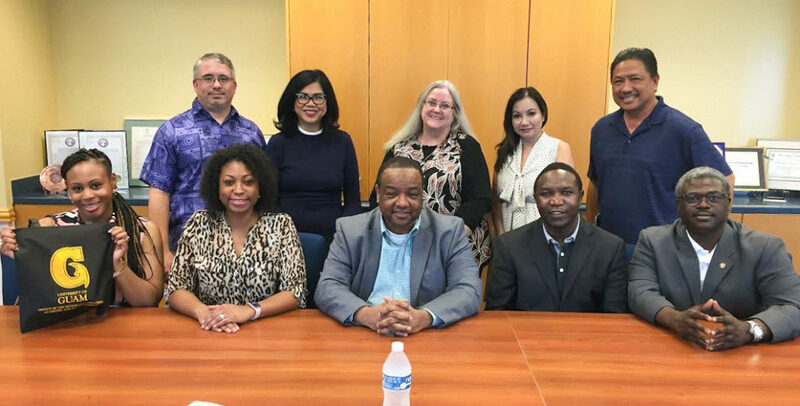 On February 28, 2019, representatives from the Langston University Rehabilitation Research and Training Center (LU-RRTC) met with University of Guam (UOG) officials to discuss opportunities for the territory to conduct research in the field of disability and rehabilitation. Langston University will work in collaboration with UOG to provide technical assistance in grant writing, conducting research, data analysis, and research publication. Sitting from L-R: LU-RRTC Representatives: Dr. Courtney Ward-Sutton, Post-Doctoral Fellow; Dr. Renee Starr-Howard, Post-Doctoral Fellow; Dr. Corey L. Moore, Principal Investigator and Research Director; Dr. Edward O. Manyibe, Research Associate & Capacity Building Director; Dr. Andre L. Washington, Research Assistant Professor & Technical Assistance Coordinator. Standing L-R: UOG Staff: Dr. Troy McVey, Interim Assistant Vice President, Director of Graduate Studies; Dr. Anita B. Enriquez, Senior Vice President; Dr. Heidi San Nicolas, CEDDERS Director; Dr. Josephine Cruz, CEDDERS Training Associate; and Peter Barcinas, Institutional Review Board Chair. 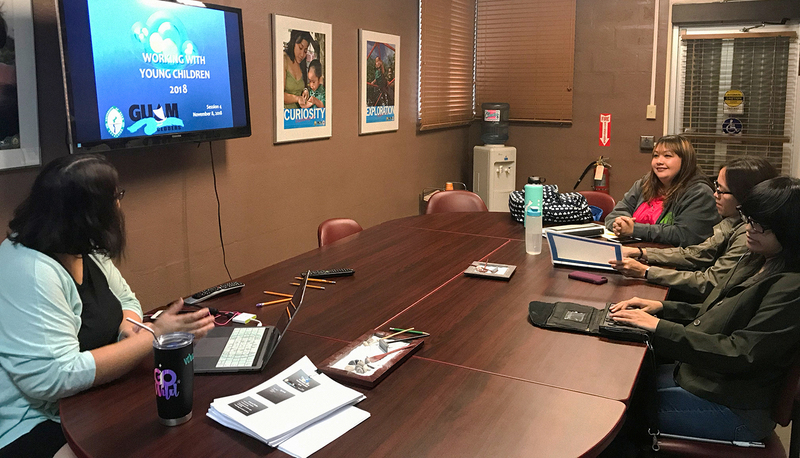 Guam CEDDERS facilitated a webinar on August 28 conducted by Donna McNear, M.Ed., Vision Impairment (VI) Consultant, for Guam Department of Education, Division of Special Education VI Program personnel. 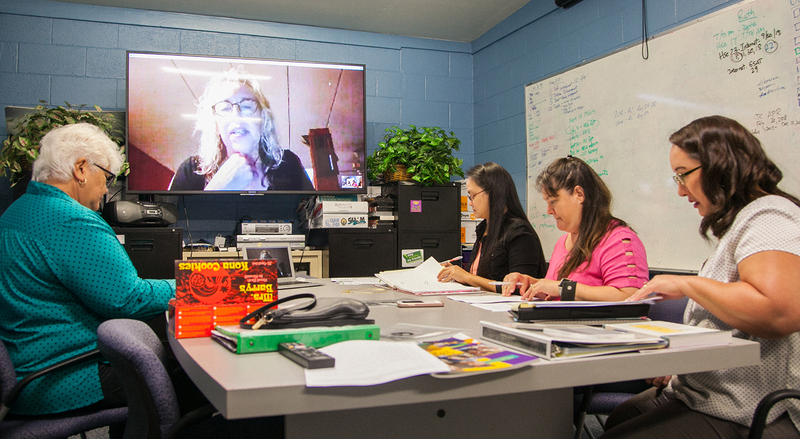 Attending the two-hour webinar were (L-R): Terrie Fejarang, Guam CEDDERS; Donna McNear (on screen); Darlene Taimanglo, Part B & C VI Technical Assistance (TA) Provider; Diane Artero, Part B VI TA Provider; and Tricia Taitague, VI Program Coordinator. 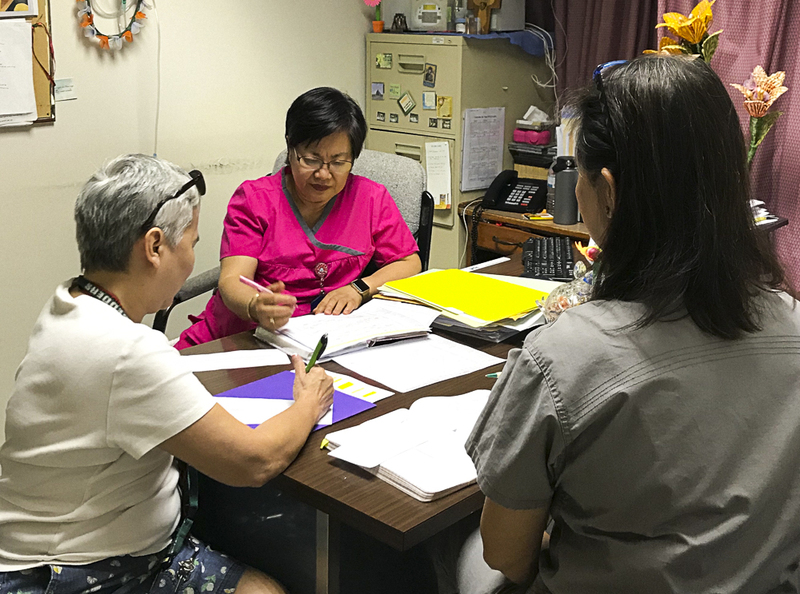 L – R: On July 11, 2018, Marie Wusstig, Guam CEDDERS Training Associate met with Guam Memorial Hospital Authority (GMHA) nursing supervisors, Avelina “Bing” Opena, RN, NICU supervisor and Ma. Victoria “Marivic” Guiao, RN, OB Ward supervisor to review results and recommendations of the Hearing Screening Compliance Survey. Supervisors provided additional input for the training objectives for the upcoming “Hearing Screening Protocol and Equipment Training”, scheduled for July 16 – 17, 2018, which will be facilitated by, Renee L.G. Koffend, AuD, CCC-A, Guam EHDI Audiologist Consultant. 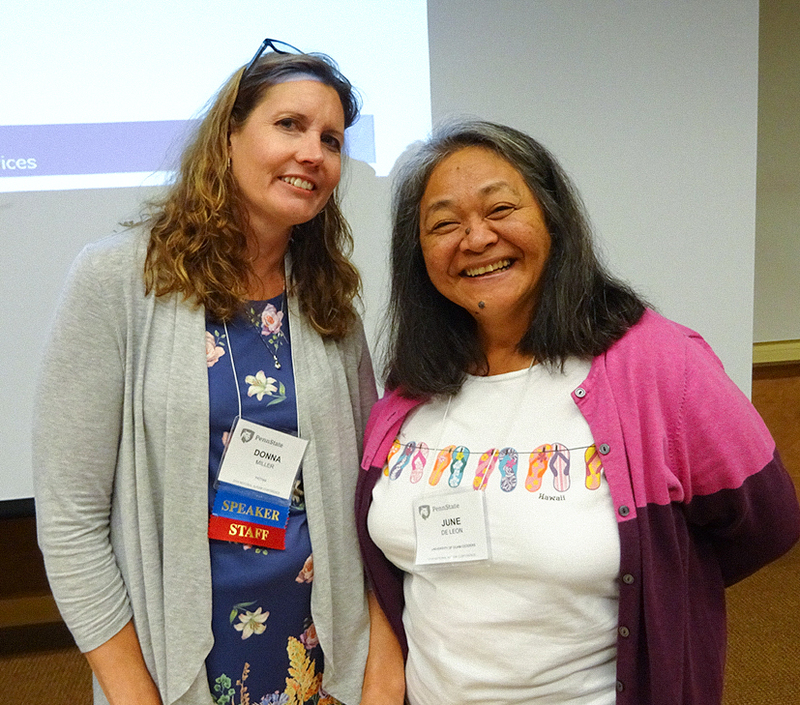 Marie Wusstig and Terrie Fejarang, Guam EHDI staff members, facilitated the second Learning Community Meeting held on June 1. Learning Community participants included three parents and a sibling, a pediatrician, an audiologist, nursing supervisors from Guam Memorial Hospital Authority and Guam Regional Medical City, and representatives from Sagua Mañagu Birthing Center, Guam Early Intervention System and Guam EHDI. A lively interactive discussion took place focusing on the promotion of a Shared Plan of Care (SPoC). Joseph Mendiola, Guam Early Hearing Detection and Intervention (EHDI) Interoperability Manager, facilitated the Evaluation Work Group meeting with EHDI ChildLink users on June 1. 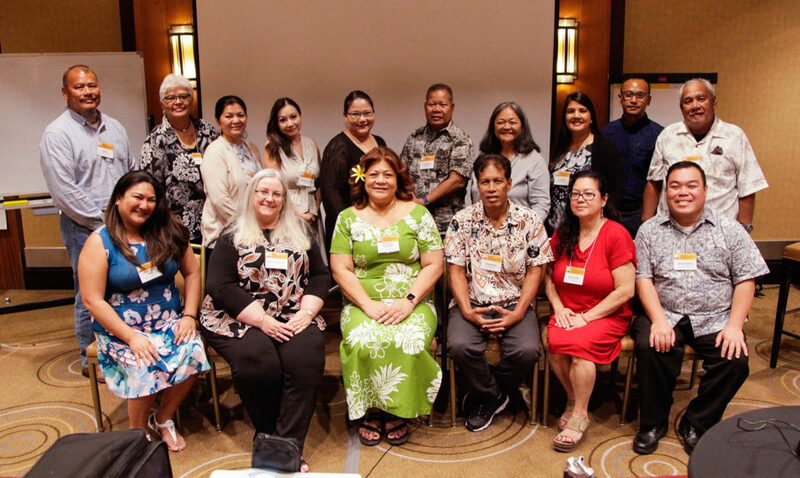 Participants of the Work Group included three parents, an audiologist, and representatives from the three civilian birthing sites, Guam Memorial Hospital Authority, Sagua Mañagu Birthing Center, and Guam Regional Medical City, as well as from Guam Early Intervention System and Guam EHDI staff. 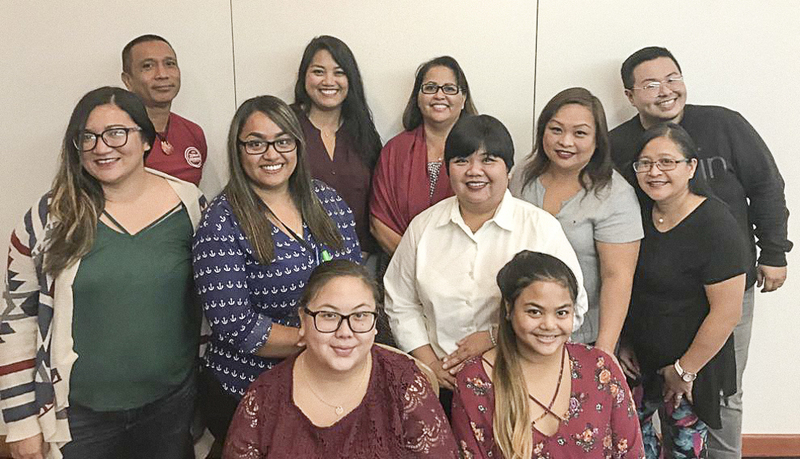 Jenika Ballesta, CEDDERS Research Associate (front right), and Vera Blaz, CEDDERS Training Associate (middle row), co-facilitated the Project Bisita I Familia Parent Cafe on May 18, 2018 at the Pacific Start Hotel. The theme for the cafe was “Taking Care of Yourself.” Thirteen parents participated in the event.